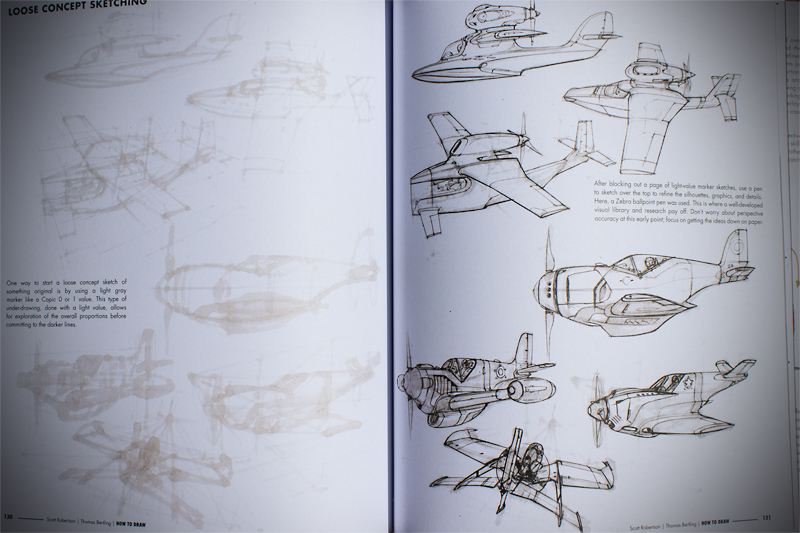 My review of Scott Robertson’s book How to Draw: Drawing and Sketching Objects and Environments from Your Imagination. Today I’m going to try a different format for this art book review. It’s going to be based on the “five Ws and one H”. Who, What, When, Where, Why, and How (but I am rearranging them to What, Who, Why, How, When, and Where). What? What is this book about? 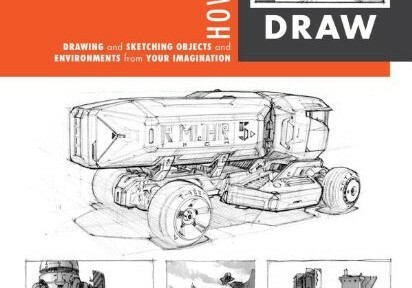 How to Draw: Drawing and Sketching Objects and Environments from Your Imagination is about perspective. It is essentially a roadmap, almanac, or bible of perspective. It is the designers best friend. Are you having trouble constructing perspective grids? This book is for you. Do you want to learn how to mirror objects in perspective? This book is for you. Do you wish you could draw airplanes but they are just so darn complex and intimidating? This book is for you. Who? Who is Scott Robertson? Thomas who? Would you still read an art book if the author was incompetent or had no experience in the art field? I know I wouldn’t. Scott Robertson is extremely competent and he has years of experience in the art/design world. Scott has authored nine Gnomon DVDs about rendering and designing. If you didn’t already know, The Gnomon Workshop is some of the top of the line art/design instruction in the world. Scott is the former chair of Entertainment Design at the Art Center College of Design. He has designed for Hot Wheels, theme parks, BMW, Mattel Toys, Rockstar Games, and Fiat. That sounds pretty knowledgable and competent to me. Scott Robertson technically co-authors the book with Thomas Bertling. Bertling is the Director of Entertainment Design at the Art Center College of Design. Bertling has worked with clients such as Disney and Samsung. Why? Why is this book important? Perspective is necessary for good drawing. That’s just a fact of life and if you ignore perspective, your work will suffer. Perspective matters! 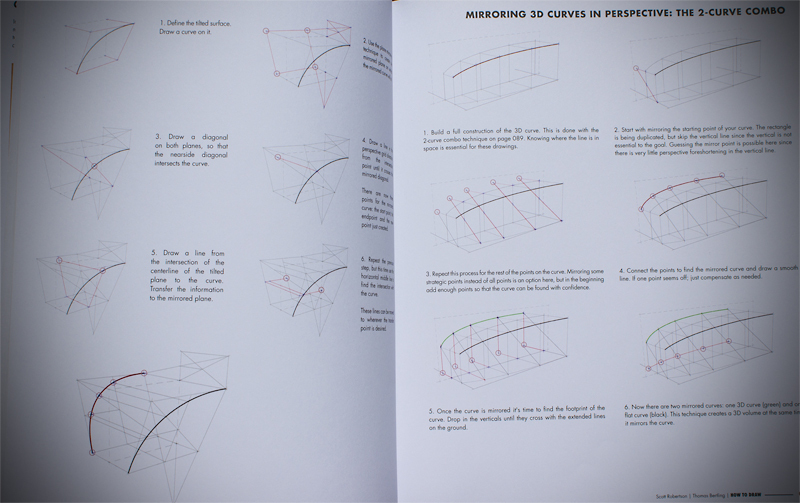 This book covers many aspects of perspective and design. How? How does this book teach? Scott and Thomas talk in an easy to understand language. Perspective is complex but they start from the foundation and work their way through the more complex aspects of perspective and design. Every lesson is broken down into smaller steps and each step is thoughtfully transcribed and illustrated. Throughout the book there are even links to videos by Scott Robertson to further explain a topic. 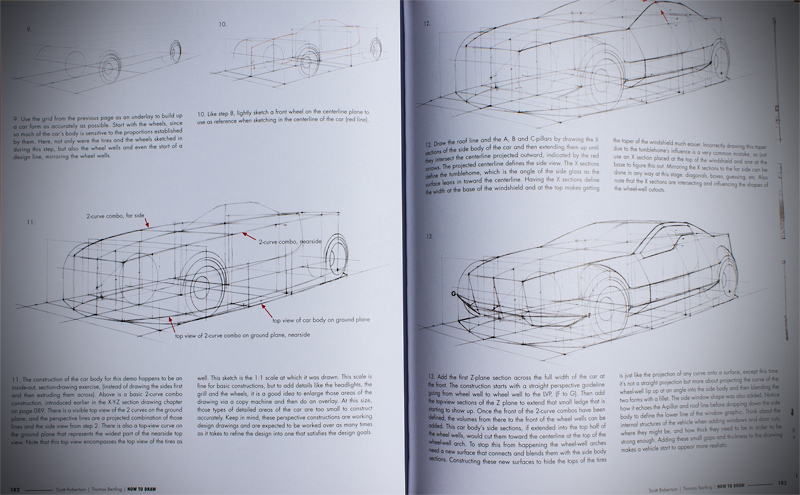 The book starts by discussing drawing materials and some basic skills. Perspective terminology is covered next and then perspective drawing techniques. 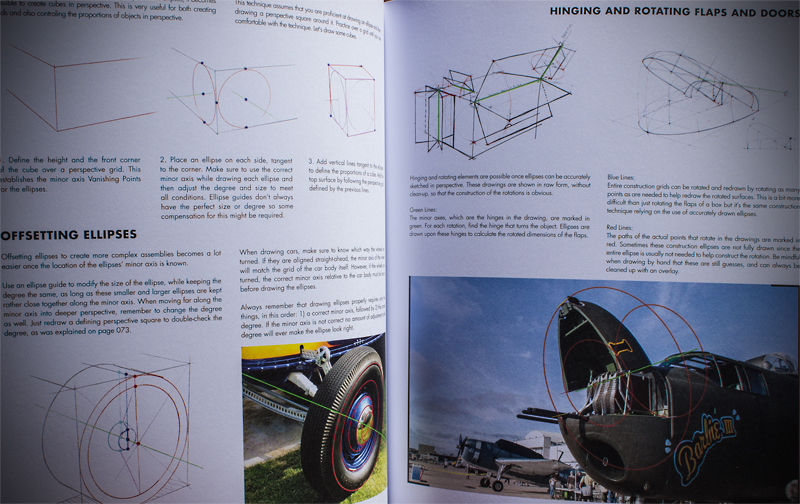 There’s a chapter dedicated to creating grids, and a chapter for ellipses and rotations. They cover working with volume, drawing environments, drawing aircraft, drawing wheeled vehicles, and finally sketching styles and mediums. When? When should you add this book to your collection? 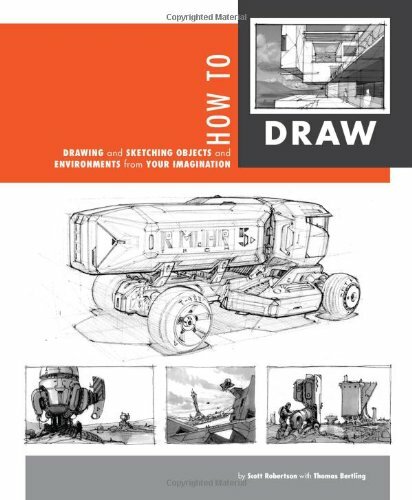 You should add How to Draw: Drawing and Sketching Objects and Environments from Your Imagination to your collection as soon as you can afford to purchase it. Paired with maybe one or two other perspective books and your perspective book collection will be complete. Where? Where can you purchase this book? You can purchase it on Amazon, here. It’s a remarkable value for the size of the book, the printing quality and the price. As of writing this review, the paperback edition is available on Amazon for only $25.27. This is the first book I’ve ever read from Design Studio Press and I am very impressed. It is over 200 pages long, it’s 9″ x 11″ and almost an inch thick. The paper stock is THICK. Every time I turned a page I thought there were pages stuck together because the paper stock is so nice. I look forward to more books from Design Studio Press. It’s been a while since I’ve read the book but I think it’s mostly concerned with perspective (which is very important to drawing a cube perfectly). What sort of basics of art are you looking to learn?